“Falling feels like flying, until you hit the ground. With only one week to go until Marathon Mont-Blanc, I’m in a reflective mood, so thought it was worth reminding myself, and everyone else, why I’m doing it in the first place. On paper, 2013 was a pretty good year for me. My family was completed in November 2012 with the arrival of Caspar, who was thriving. He’d arrived at the perfect time, as I was able to extend my paternity leave across Christmas and New Year, so for the first time in 7 years I’d had 5 weeks off work in a row. We were settled in our first proper house, and after falling out of love with it for a while, we had made the firm decision that London was the best place in the world for us to be. In 2013 I also managed, after 7 months of interviews, tests and other complications, to get a new and very sought after job. Because of the change in employment, I wangled an even longer 6 week break, and was Blackberry free for the first time since 2006 (it felt like I had lost a limb, but in a good way). As far as running was concerned, I was in the form of my life. I trounced the 2012 me by improving my marathon personal best by over 20 minutes, and scored half marathon, 10km and 5km PBs. In October I completed my first ever ultra marathon, on a beautiful day, in the greatest city in the world. As I’ve said before, the Royal Parks Ultra is the best race I’ve taken part in. Faultlessly organised, brilliantly supported and a gorgeous route through or alongside some of London’s best assets, the Royal Parks and the Thames Towpath. My personal race also could not have been better; my only sensibly paced start, hydration and food just right, and an endorphin kick just when I needed it at 30 miles. The only slowdown was the most, if not only, spiritual moment in my life. 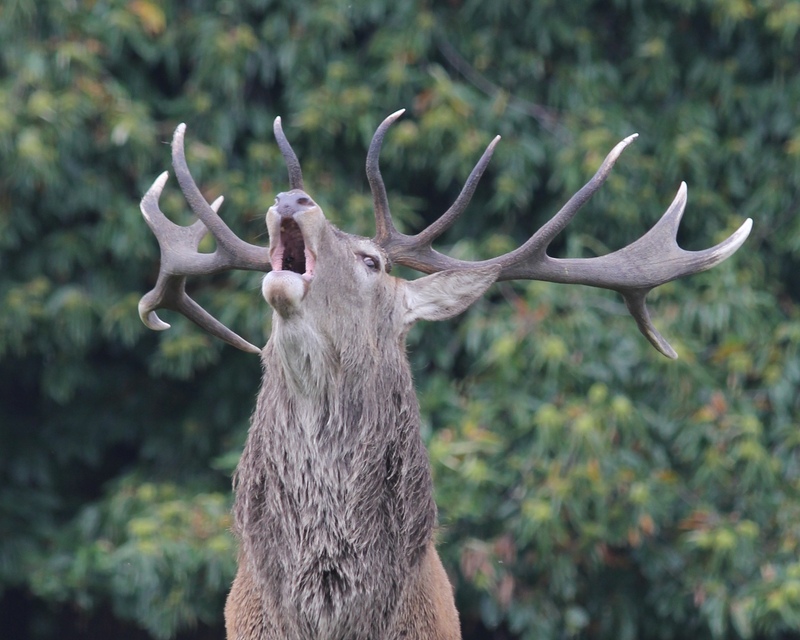 Just after entering Bushy Park, I turned a corner and saw something blocking my path – a huge, magnificent stag. I stopped dead. Runner’s World has not yet covered what the hell to do in this situation, so I was a bit lost for ideas. He looked me straight in the eye, shook his head, and to my relief disappeared into the trees. A sign? An omen? Did he know where my life was headed? Of course not, this isn’t a bloody novel. But a powerful experience nonetheless. After all of this, a free massage and getting to cross the finish line again, this time with Freddie (we finished last in the kids race, but they gave him a medal so he still insists that he won), it turned out that I finished 36th, which I am still very proud of. So why wasn’t I happy? Starting a new job the next day was definitely not the best idea, but it wasn’t nerves I was feeling, it was dread. Not about work, not because my legs were hurting, just a general feeling that something wasn’t right. Did I sense what was coming, at least subconsciously? Definitely not, but I should have. At the time, I thought that I was in great shape, but looking back I was a stone underweight, and my eyes were blank. Hindsight is a wonderful thing, but the weekend after the Ultra is when I should have admitted to myself that I was ill.
I’ve talked before about depression not being the presence of sadness but the absence of hope, and this is exactly how I felt. For the first time in my adult life, I had nothing to blame for being down. For as long as I can remember, I had a focal point for anxiety, bleakness, and intermittent lethargy and extreme energy: school, being a teenager, girls, moving away from home, girls, university, girls, getting a job, moving to London, girls, buying a house, proposing to and marrying girl, working abroad, marathons, being a parent, lack of sleep, moving job, moving house, being a parent again and family illness and death. With nothing in particular to focus on or worry about, with the rest of my life in front of me, I felt nothing. I had also become very intolerant and short-tempered, but denied it every time someone (usually Camilla) brought it up, making me even more intolerant and short-tempered. More worryingly, I had also been forgetting whole conversations, which led to more anger when the person I was speaking to (usually Camilla) insisted that I had already told her or she had already told me about whatever it was we had or hadn’t discussed. Frankly, I can’t imagine why Camilla stayed. Although at the time she was convinced that I had depression, I was still denying there was anything wrong, so refused to get help. More than that, even if I was suffering from depression, I was, and still am at times, impossible to talk to calmly and rationally about myself. As this is my last post before the race, I would like to ask you one last time to please donate to my fundraising efforts, in aid of CALM and Mind, by going to my fundraising page here. If you don’t know them already, you can read all about the fantastic work they do on their respective websites (hyperlinked above), or on my first post (Running, Hills and Bipolar). Posted on June 21, 2015 August 9, 2016 by updownrunner	This entry was posted in Uncategorized. Bookmark the permalink.